Mega Sale! Up to 23% off on Stationery & Party Supplies at Nicky's Blog, Page 4. 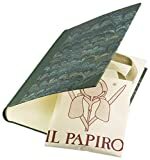 Top brands include Il Papiro - Firenze, Xezo Pens, DiAmoreDS, ByApryl, Irish Pens, Katya Paperie, Social Stationery, Historical Woods of America, Bendecidos Pens, & Terra Negra Studio. Hurry! Limited time offers. Offers valid only while supplies last. 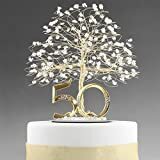 50th Anniversary Cake Topper Centerpiece in Gold Tone Wire with Quartz Crystal and Number 50. 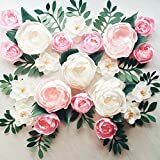 Paper flower wall display. Girl nursery wall decor. Garden party photo booth. Crepe paper wall flowers. Baby shower flower backdrop.